The Vision starts off a couple of months after The Mark leaves off. Cassie has spent some time with Jack (the boy she came home to last book), but when she realizes that she can't trust him with her secret, she decides to leave and search for answers. In her new town she meets Zander, and they enter into a whirlwind relationship. But things get complicated when Cassie finds out that Zander has secrets of his own. Then she has to decide what she believes, and if she has what it takes to follow through. I liked The Mark quite a bit, and I was looking forward to the next chapter of Cassie's life. I have to say, I didn't care for The Vision as much as The Mark. 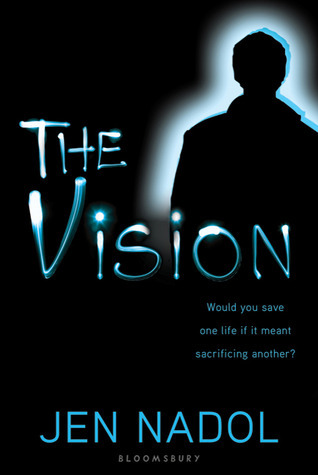 I thought that The Mark seemed really original and fresh, but that The Vision felt like any other paranormal romance. I felt like it was lacking the deeper philosophy which made the first book so interesting. That being said, I did still enjoy it. There was a mystery to this book that was fun to discover, and a lot more focus and explanation of the Greek Mythology behind Cassie's abilities. Zander was a great new character, one of those you don't know how you feel about until the end. Their romance was fast and furious, but also strange and unsettling. I didn't care for the way that Cassie seemed to lose herself when she was around Zander, constantly making excuses for his behavior. I felt like she was so unsure of herself, and I just wanted her to find confidence. I also felt like we got jipped out of her relationship with Jack. The whole last book, I wanted her to find her way back to Jack, and when she finally did, the book ended. This time, when the story picked back up, she had already had her relationship with him, and was moving on. But, hey....there's always book 3, right? Overall, I thought that this book was good, but not as good as the first. If you enjoyed the first one in the series, you'll probably want to pick this one up too, though. One of the good things about these books is that they both have their own story arc, and could easily be stand-alones. If you're a fan of Greek Mythology, Philosophy, or Rachel Vincent's Soul Screamers Series, you might like these books!